Designed to help adults with severe to profound hearing loss, cochlear implants mimic the natural hearing function of the inner ear. 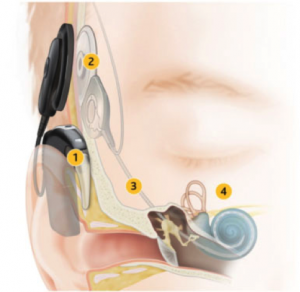 Cochlear Americas’ Nucleus 6 cochlear implants do the job of the hair cells in the inner ear. Whereas hearing instruments make sounds louder, a cochlear implant helps to restore your ability to perceive and understand sound. A cochlear implant doesn’t make sounds louder-rather, it uses uniquely designed electrodes to bypass the damaged part of the ear and send digital signals directly to the auditory nerve to provide a clear understanding of sound and speech. Candidate criteria for a cochlear implant includes a moderate to profound sensorineural hearing loss, limited benefit with the use of hearing instruments, no medical contraindications, post-surgical realistic expectations, and a high level of patient motivation.